You will find below occasional Archaeological finds from Bere Regis Villagers in our Village... Note 1 In about 2003, a small stamped brass button was found, during gardening, in the plot behind No.88 West Street/Central Stores. 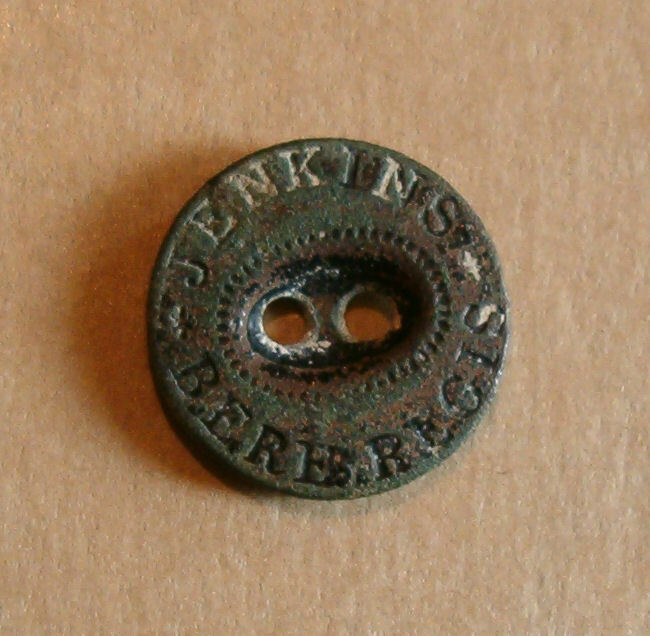 The button’s diameter is 16.5mm and the stamping reads "Jenkins - Bere Regis". Henry Charles Jenkins was a tailor at the beginning of his trading life, so the button almost certainly dates from between 1866 and 1889 as the description of tailor drops off his list of activities in the 1890s. Henry Charles Jenkins Born: unknown but probably between 1831 and 1841 Died: 27 February 1904 Place of business: No.12/13, North Street, Bere Regis Trade Directory entries between 1830 and 1939:- 1867 Henry Charles Jenkin, tailor 1871 Henry Charles Jenkins, tailor 1875 Henry Charles Jenkins, tailor 1880 Hy. Chas. Jenkins, tailor & woollen draper 1885 Henry Charles Jenkins, tailor, woollen draper, hatter, stationer & fancy goods dealer & Post Office. 1889 Henry Charles Jenkins, tailor, woollen draper, hatter, stationer & fancy goods dealer, assistant overseer & collector of rates, Post Office. 1898 Henry Charles Jenkins, grocer & stationer, assistant overseer & collector of rates, Post Office. 1903 Henry Charles Jenkins, grocer & stationer, assistant overseer & clerk to the Parish Council, Post Office. Note 2 In 1971 it was noticed that damp was penetrating the walls of the church. It was decided that to solve this problem to dig a trench around the outer walls so that the walls could dry out. This long term solution is still evident and was successful. During the digging process one coin was found. It was a penny which was quite worn, but had the distinctive double-head of William & Mary who reigned jointly between 1689 and 1694. The wear suggests that it was lost twenty or so years after those dates. The real value of a penny in about 1700 was about 400 times its value in 2000, so about £1.66 in today's money. Brief summary of William and Mary's Reign William III's reign had its origins from 14 April 1687 when King James II granted freedom of worship in England, Scotland and Wales. When his wife Mary had a child there was a real risk she would be raised a Catholic, and by 30 June 1688 Whig leaders invited the King's son-in-law William of Orange to rule the UK. James II took flight from London on 23 December 1688 as William of Orange entered the city. Before the Whig plan could be sealed William III and Mary II were proclaimed joint monarchs of the UK and its colonies. On 30 June 1690 at the Battle of Beachy Head the French defeated an English fleet under Admiral Herbert, Lord Torrington, then the next day, 1 July, the Battle of the Boyne saw William III's army defeat the Catholic pretender James II and his French army; the ex-King returned to exile in France. The Battle of Aughrin culminated on 12 July 1691 with William and Mary's General Ginkel defeated the Irish army under the Earl of Lucan, then on 3 October 1691 Limerick surrendered to Ginkel after a siege, and this led to the Treaty of Limmerick. In 1692 William and Mary sequestered Pennsylvania from William Penn and transferred it to the Governor of New York, Benjamin Fletcher. Meanwhile on 13 February 1692 the Massacre of Glencoe involved the Campbells killing every member of the MacDonald clan aged under 70 years. Then on 24 July 1692 the French defeated an English army at the Battle of Steenkirken. In 1693 William III initiated the "national debt" by borrowing over £1 million from the Bank of England to fight his wars with various European states. The BoE received a charter in 1694. On 29 July 1693 the French beat an English army in the Battle of Neerwindon, but the next year the Royal Navy bombarded the ports of Dieppe, Dunkirk and Le Havre. In September 1695 William III's forces captured Namur. In 1696 an Assassination Plot was discovered to murder William III and Sir George Barclay and Sir John Fenwick were hanged. In 1697 on 30 September the Treaty of Ryswick ended the 'War of the League of Augsburg' with France recognising William III as King of England, Wales & Scotland with Anne as Heir-presumptive. In 1698 the English authorities recognised the slave trade, opening it up to British merchants, leading to increased trade, then the founding of the London Stock Exchange in the same year. Also in 1698 Thomas Savery invented the steam engine to pump water out of coal mines. Also in 1698 Whitehall Palace burned down. In 1701 Jethro Tull invented the seed drill, but on 7 September 1701 war clouds returned with the 'War of the Spanish Succession' with England joining the alliance of Italy, Holland and Savoy, against Spain and later France. William III died on 8 March 1702, aged 51, after falling from his horse, and he was succeeded by his sister-in-law Anne. You will find below occasional Archaeological finds from Bere Regis Villagers in our Village... Note 1 In about 2003, a small stamped brass button was found, during gardening, in the plot behind No.88 West Street/Central Stores. 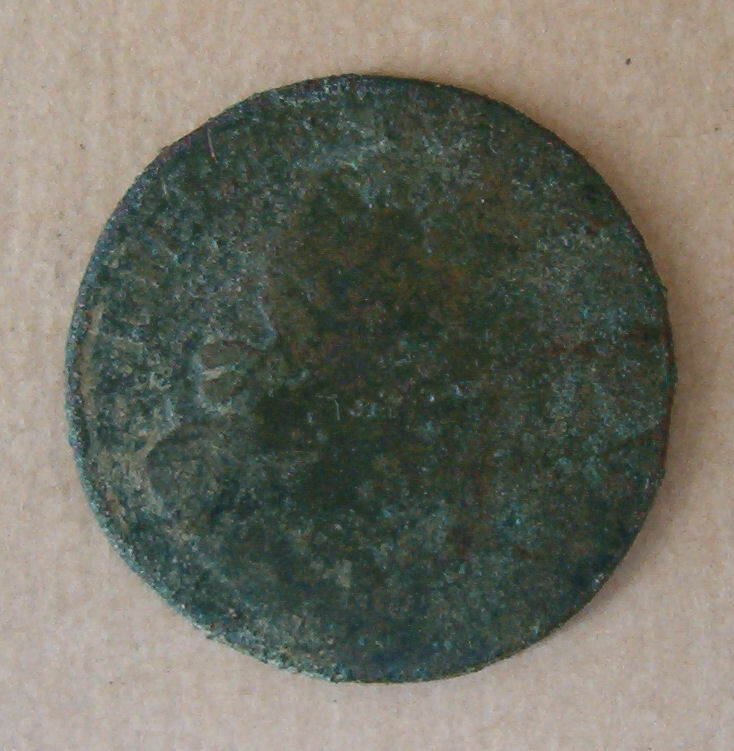 The button’s diameter is 16.5mm and the stamping reads "Jenkins - Bere Regis". Henry Charles Jenkins was a tailor at the beginning of his trading life, so the button almost certainly dates from between 1866 and 1889 as the description of tailor drops off his list of activities in the 1890s. Henry Charles Jenkins Born: unknown but probably between 1831 and 1841 Died: 27 February 1904 Place of business: No.12/13, North Street, Bere Regis Trade Directory entries between 1830 and 1939:- 1867 Henry Charles Jenkin, tailor 1871 Henry Charles Jenkins, tailor 1875 Henry Charles Jenkins, tailor 1880 Hy. Chas. Jenkins, tailor & woollen draper 1885 Henry Charles Jenkins, tailor, woollen draper, hatter, stationer & fancy goods dealer & Post Office. 1889 Henry Charles Jenkins, tailor, woollen draper, hatter, stationer & fancy goods dealer, assistant overseer & collector of rates, Post Office. 1898 Henry Charles Jenkins, grocer & stationer, assistant overseer & collector of rates, Post Office. 1903 Henry Charles Jenkins, grocer & stationer, assistant overseer & clerk to the Parish Council, Post Office. Note 2 In 1971 it was noticed that damp was penetrating the walls of the church. It was decided that to solve this problem to dig a trench around the outer walls so that the walls could dry out. This long term solution is still evident and was successful. During the digging process one coin was found. It was a penny which was quite worn, but had the distinctive double-head of William & Mary who reigned jointly between 1689 and 1694. The wear suggests that it was lost twenty or so years after those dates. The real value of a penny in about 1700 was about 400 times its value in 2000, so about £1.66 in today's money. Brief summary of William and Mary's Reign William III's reign had its origins from 14 April 1687 when King James II granted freedom of worship in England, Scotland and Wales. When his wife Mary had a child there was a real risk she would be raised a Catholic, and by 30 June 1688 Whig leaders invited the King's son-in- law William of Orange to rule the UK. James II took flight from London on 23 December 1688 as William of Orange entered the city. Before the Whig plan could be sealed William III and Mary II were proclaimed joint monarchs of the UK and its colonies. On 30 June 1690 at the Battle of Beachy Head the French defeated an English fleet under Admiral Herbert, Lord Torrington, then the next day, 1 July, the Battle of the Boyne saw William III's army defeat the Catholic pretender James II and his French army; the ex-King returned to exile in France. The Battle of Aughrin culminated on 12 July 1691 with William and Mary's General Ginkel defeated the Irish army under the Earl of Lucan, then on 3 October 1691 Limerick surrendered to Ginkel after a siege, and this led to the Treaty of Limmerick. In 1692 William and Mary sequestered Pennsylvania from William Penn and transferred it to the Governor of New York, Benjamin Fletcher. Meanwhile on 13 February 1692 the Massacre of Glencoe involved the Campbells killing every member of the MacDonald clan aged under 70 years. Then on 24 July 1692 the French defeated an English army at the Battle of Steenkirken. In 1693 William III initiated the "national debt" by borrowing over £1 million from the Bank of England to fight his wars with various European states. The BoE received a charter in 1694. On 29 July 1693 the French beat an English army in the Battle of Neerwindon, but the next year the Royal Navy bombarded the ports of Dieppe, Dunkirk and Le Havre. In September 1695 William III's forces captured Namur. In 1696 an Assassination Plot was discovered to murder William III and Sir George Barclay and Sir John Fenwick were hanged. In 1697 on 30 September the Treaty of Ryswick ended the 'War of the League of Augsburg' with France recognising William III as King of England, Wales & Scotland with Anne as Heir-presumptive. In 1698 the English authorities recognised the slave trade, opening it up to British merchants, leading to increased trade, then the founding of the London Stock Exchange in the same year. Also in 1698 Thomas Savery invented the steam engine to pump water out of coal mines. Also in 1698 Whitehall Palace burned down. In 1701 Jethro Tull invented the seed drill, but on 7 September 1701 war clouds returned with the 'War of the Spanish Succession' with England joining the alliance of Italy, Holland and Savoy, against Spain and later France. William III died on 8 March 1702, aged 51, after falling from his horse, and he was succeeded by his sister-in-law Anne.